3,000 Sq. 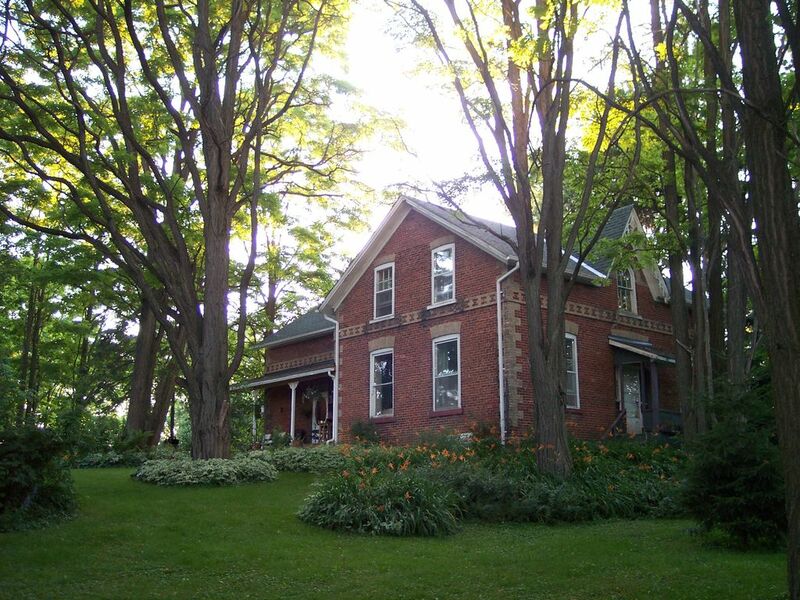 Ft. 3 Bedroom, 2 Bathroom Heritage Farmhouse On 90 Acres. Exclusive use of the farmhouse and 2 acres of lawn. Perfect for families wanting a rural experience. Ample parking for cars, boat/trailer. Guests have use of three bedrooms - two with queen beds, one with two single beds. Linens provided. Fans available for bedrooms. The kitchen is fully equipped with all appliances, cooking utensils, dishes, etc. Supermarkets and shopping malls located less than 15 minutes away in Ajax, Uxbridge or Port Perry. Livingroom has widescreen satellite tv, stereo system and electric fireplace. Board games and dvd's available. The lawns have volleyball, badminton, golf net, firepit, propane bbq, lawn chairs and tables and hammock. There is also a fish pond. Due to the limitations of the farmhouse well and septic sewer systems, we can't accommodate more than 6 overnight guests. Also, we have to limit the total number of registered guests and others to no more than 15 at anytime. The primary renter must be at least 30 years old. SORRY, THERE IS NO INTERNET OR WIFI. IF YOU NEED INTERNET ACCESS, YOU WILL HAVE TO ARRANGE A DATA PLAN WITH YOUR CELLPHONE PROVIDER. Ron and Cheryl are both retired, after long careers in banking and education. They split their time between their home in Toronto and the farm. The farm has been in Cheryl's family for 40 years. In the early 1800's, the first owner was John Elmsley, Chief Justice of Upper and Lower Canada. The farm produces corn, hay, soybeans, wheat and other cash crops. A large crop of fireflies is produced in the summer. Our family has been fortunate to have this country retreat to escape the noise and crowds of Toronto. We would like to give others the opportunity to enjoy this unique experience of farm life that is so close to the city but a world away spiritually. The farmhouse is located on a quiet rural road, surrounded by fields, woods and horses. It is on a wooded lot set back from the road, yet is a short drive to shopping, golf and skiing. Conveniently located to conservation areas and nature trails. An assortment of toys for young children. The house was really beautiful, we liked hammock outside. The kids had fun playing with the toys and watching the movies on a rainy days. Parents liked hanging out on the porch. Lots of space for all of us. The kitchen is nicely stocked up. The fire pit was setup with firewood so we were able to light it up easily. The location is 45 minutes from Toronto, but we all like to travel on ETR road. Owners are very nice and kind. Thank you for your hospitality! We (six adults) spent a long wknd here to attend a wedding. The house is classic farm house. Quaint. The kitchen was large and the living room very comfortable. There were personal items everywhere making the house seem cluttered. The Jack&Jill bathroom upstairs was nonfunctional for 6 adults. The Master Bedroom had no closet and the armoire was filled by a TV. Outside the gardens were overgrown and the ticks were plentiful. Would we rent it again. No Reading the reviews this place maybe better for families with kids who want a rustic experience. Hello Robert. Thank you for taking the time to provide a review. We are very sorry that your stay at our house was, at best, average. We work hard to provide our guests with a comfortable authentic farmhouse stay. And you are right that our target market is large families who want an authentic rustic farm experience. We've updated the Property Description on our site to highlight this. We apologize if it appears cluttered. As the farm is used 90% by our family and friends, it has accumulated our belongings and treasured mementos over the years. With regard to not having enough closets, farmhouses of the 19th century often did not have them as wardrobes tended to be modest. We know that tics can transmit diseases and we are constantly on the lookout. Our family has owned the farm for 45 years and we've had many relatives, friends and VRBO guests without incident or complaint. We will continue to closely monitor this issue. We note your comment that the 2nd floor bathroom was nonfunctional. We would have appreciated a few more details as we've often had groups of up to 10 stay at the farmhouse without complaints that the two 3 piece bathrooms were inadequate. The farmhouse was very comfortable and well equipped. Plenty of antique furniture and a rustic setting. Owners were very accommodating. No complains. My family and I loved our stay at the Farmhouse. It is a beautiful property. It is a peaceful atmosphere and retreat for city dwellers. The porch is the perfect place to enjoy tea and coffee while watching the birds and chipmunks. It was great to be able to prepare food in the kitchen, use the washer and dryer as needed, watch Satellite TV when it was raining. My kids enjoyed the ping pong table in the basement. A great place for families! Hope to visit again in the future. As a family we enjoyed the peace and tranquility of the farmhouse. It was most enjoyable and will be remembered with fondness. So much fun was had by all, the location was convenient to Pickering downtown where we had an event to attend. It was a wonderful experience and we all really enjoyed looking out the kitchen window to see 4 wild turkeys walking on the driveway a few yards away. It is a beautiful country home with all the convenience of being at home for a family travelling together. This property was a lovely break from the City but was within a 15 minute drive of anything that you might need. The house is a beautiful old farmhouse set back from the road and surrounded by 90 acres of farmland. The house was even better than we expected and Ron and Cheryl were very helpful. I would recommend this property to anyone looking for a private getaway. Within 10 km., there are six golf courses, three conservation areas and two ski hills.